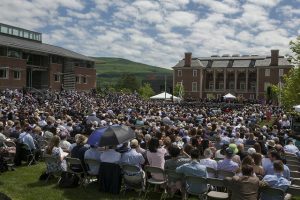 On Sunday, June 2, 2019, President Maud S. Mandel will confer bachelor’s degrees on this year’s graduating seniors and award master’s degrees to students in the Program in the History of Art and fellows from the Center for Development Economics. Congratulations to all the graduates and their families! Ivy Exercises, Saturday, June 1, 1:10 p.m.
Baccalaureate, Saturday, June 1, 5:00 p.m.
opens to visitors at 8:00 am, procession begins at 9:30 a.m.
President’s Reception, Sunday, June 2, 12:15 p.m. Graduates and their families will receive a detailed schedule of the weekend’s program in March. For commencement questions, please contact the Office of Commencement and Academic Events by email or by phone at 413-597-2347.